The Colorado Avalanche rookie camp started last Friday, bringing hockey back from summer slumbers. Prospects now get to show how they have progressed since last year. The rookies are competing for where they fit in the organization. To help with evaluating their progress, the Avalanche are participating in a rookie tournament for the third year in a row, offering a chance to see how their rookies match-up to those of other clubs. Rookie camp also provides glimpses into the depth of the development pipeline. Rookie camp comes with a warning. It’s not a deep dive into talent assessment. With 28 active participants swirling around the ice for an hour and a half,one can only follow a handful of players and watch what they can do so the heavier analysis will have to come after the full training camp. The upcoming Vegas Rookie Faceoff tourney will provide a little more insight but it also only scratches the surface of what is possible for the Avalanche’s future. Keep in mind, rookies are playing against rookies. When the NHL starters hit the ice, everything changes. Here are a few takeaways from this season’s sole rookie practice in Denver. Remember starting camp thinking that every prospect could make the big club and hoping that all players are healthy? Well, that’s the hope. Unfortunately for the Avalanche, their number one defenseman, Conor Timmins, is still recuperating from a concussion sustained in the OHL playoffs last spring. On Friday, assistant general manager Craig Billington issued a statement saying that Timmins would be unable to participate in the upcoming rookie showcase due to lingering concussion issues. Billington added that Timmins has made progress recently. He was at the practice rink but never laced up the skates. Timmin’s condition is concerning because, in 2014, the Avs acquired a talented center named Jesse Winchester. A Calgary Flames player laid a hit on Winchester in a preseason game and Winchester suffered a concussion. Twice over the following year, he looked ready to return to the ice only to have his symptoms reappear. Between Winchester and captain Gabriel Landeskog’s struggles to overcome a concussion, the Avalanche should be cautious. Hopefully, Timmins will continue to improve, but it’s a concerning start for the promising defenseman. 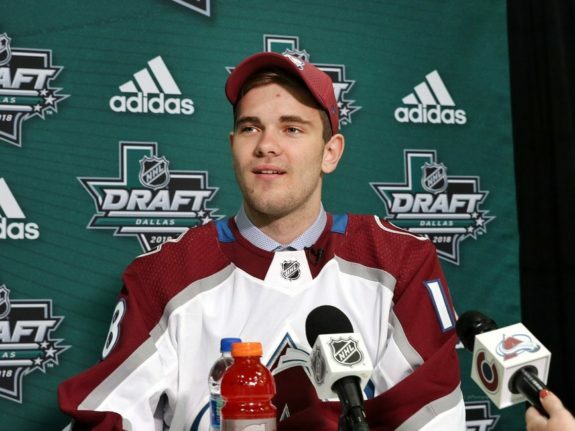 On a happier note, the Avs rolled out a forward combination of Martin Kaut (this year’s first-round draft pick), Vladislav Kamenev (a promising center acquired in the Matt Duchene trade) and Igor Shvyrev (a fifth-round pick from last year’s draft class). The trio is fast, skilled and was the strongest forward combination on the ice. There’s something to be said for having gifted players on a line together. Ask Nathan MacKinnon if he likes having speedy Mikko Rantanen on his wing. Watching Kaut, Kamenev and Shvyrev line up against other top rookie lines should be fun. Kamenev showed the poise, control and sense of a quality center. He is a good skater, good puck-handler and also has a strong leadership quality that could help a young line. Kaut looks like a man on a mission. He hustled like a player ready to make the Avalanche out of camp, despite his youth and unfamiliarity playing on the smaller NHL ice. His intensity alone made an impression. Though he is likely to start the season with the Colorado Eagles, if he keeps improving anything is possible. Shvyrev was probably the biggest surprise with his quick hands and stick-handling ability. While Kaut and Shvyrev still need polish, they should make the Avalanche roster eventually. Kamenev should make a push for the big club right out of the gate. Though Timmins couldn’t participate in practice, there were other defensemen who stepped up to make things interesting. Sergei Boikov, healed up from the shoulder injury that cost him all of last season, made a big impression. He was solid on his skates, positioned himself well and did not shy away from big hits. In fact, as practice heated up, Boikov smashed into three different players over the course of a couple scrimmages, leaving them sprawled on the ice, including Kamenev. I guess his shoulder is good to go. Boikov often played alongside Nicolas Meloche and the pairing was the most effective defensive duo. Meloche knows how to defend the space in front of the net and was a great partner for Boikov. As for goaltenders, this is Justus Annunen’s first camp so he looked promising but still has room to grow. Petr Kvaca, on the other hand, had a greater command of his crease. He displayed solid glove and blocker skills. Kvaca could stand to improve his five-hole work and looked to be refining his rebound control but he looked confident and wasn’t flustered when defending against a four-on-two rush. Some of the Eagles’ goaltenders may want to pay attention. Also of note was the coaching. The Colorado Eagles staff ran the day, with head coach Aaron Schneekloth leading the way. Unlike previous camps where the staff kept rotating player lineups throughout the practices, this camp started out with the coaches having a pretty good idea of line combinations and defensive pairings. They occasionally deviated from the standard combinations by throwing another player in the mix but it was nowhere near the carousel from a couple years ago. That may be one of the most promising signs yet as the staff seem to have a good handle on the players and their skill sets. It was the first day of camp and still too early to make any overarching judgments. But the players showed promise as the Avalanche organization continues to develop their depth. The Vegas showcase will be interesting as the rookies continue to improve their game. Stay tuned. There’s more fun coming.